A debut goal from Aubamayeng, and two assists from Mkhitaryan were eclipsed by a hat trick from Welsh midfielder Aaron Ramsey as Arsenal put five past Everton for the second time this season. Three thousand Evertonians travelled south yet again to witness the Theo Walcott’s return to the Emirates stadium so soon after his transfer from today’s hosts, Arsenal, but it was far, far, far from a good day out to the capital. The Gunners have dropped off the pace a bit in recent weeks, their loss at Swansea in midweek again seeing calls for manager Arsene Wenger to step down. The 68-year old Frenchman is the longest serving and most successful manager in Arsenal history, but three league titles and seven FA Cups are quickly forgotten in this age of supporters demanding instant and continued success. For the visit of the Blues, Wenger re-united the former Dortmund striking partnership of Mkhitaryan and Aubamayeng in selecting a starting eleven of: Cech, Monreal, Mustafi, Koscielny (c), Bellerin, Xhaka, Ramsey, Mkhitaryan, Ozil, Iwobi and Aubamayeng. Despite a euphoric return to first team action last Wednesday in the defeat of Leicester, Seamus Coleman didn’t make the squad for the game although Theo Walcott was named against his former team. Sam Allardyce in his 500th game as a manager in the Premier League made five changes in opting for a cautious approach in playing two defensive midfielders and giving loanee Eliaquim Mangala his debut in a starting eleven of: Pickford, Martina, Mangala, Keane, Williams (c), Kenny, Schneiderlin, Gueye, Bolasie, Walcott and Niasse. Neil Swarbrick was the man in the middle for this late kick-off fixture. It didn’t take very long for the home side to expose the frailties of Everton as the failure to adequately clear the ball from an Ozil free kick saw the German find Aubamayeng who found Mkhitayan and his cross to the six yard box was swept home easily by Ramsey after just five minutes. Mkhitaryan fired a right foot shot inches wide ahead ahead of Iwobi and Ramsey combining for Aubamayeng to see his shot defected for a corner. From a second corner, Arsenal doubled their lead as Mustafi beat Williams to the cross and both Keane and Mangala were nowhere to be seen as Koscielny was allowed to stoop and head home from two yards on 13 minutes. The utterly disastrous team selection and start to the game was further compounded six minutes later as Ozil again found space and when the ball reached Ramsey 20 yards out, his side footed shot took a deflection off Mangala to wrong foot Pickford whose valiant effort to push the shot over the bar failed, and the scoreboard moved to read three-nil. 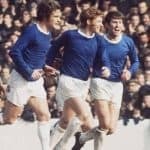 It isn’t too strong a statement to say that in well over forty years of following the Blues, I’ve not seen a worse opening twenty minutes from any Everton side, and the blame lay squarely on the shoulders of a manager whose team selection was quite frankly baffling. Theo Walcott on a fine ball from Niasse was out through and whilst Monreal slowed him down, it was a terrific challenge by Mustafi that denied the former Arsenal striker the chance to score against his former club. A sweet turn by Iwobi to get away from Keane saw him find Ozil in space and his vision and perfect pass released Aubamayeng for his first real chance to run at pace, Pickford saving with his legs to deny Arsenal a fourth. The home fans needn’t have worried though as the fourth goal duy arrived in the 37th minute. Mhkitaryan clipped the ball through the Blues back line and whilst his former Dortmund team mate was clearly offside, Aubamayeng cleverly chipped the onrushing Pickford for his debut goal. Monreal hit the post with a header off a Xhaka corner as Arsenal looked to score with every attack and moments later another cutback from Mkhitaryan saw another Monreal effort deflected wide. The only question most fans were asking as the interval loomed, was would Arsenal go nap before the cup of tea and slice of orange? Tom Davies for Michael Keane and Sead Kolanisac for Nacho Monreal were the half time changes from the two managers. A heavy challenge by Mustafi on Niasse saw the Arsenal defender rightly booked as Everton at least tried to get themselves into the game, and it was Mustafi with a good block on a Walcott shot as the Blues began much more brightly. Everton nearly cut the deficit when a superb right wing cross from Walcott saw Niasse get away from Mustafi to hit the post before colliding with Cech. A good break by Mangala saw him go fifty yards to find Walcott whose second right wing cross caused more problems in the home defence where Cech appeared to be struggling. The hour mark saw the introduction of Dominic Calvert-Lewin, replacing Theo Walcott who received a rousing and warm round of applause from fans of both persuasion. And the change worked well as Davies, clearly looking to take control of the midfield and get Everton moving forward, found Bolasie in space on the left and his cross was confidently and powerfully headed home by Calvert-Lewin to deny Cech his 200th clean sheet. Cech, who’d taken a knock in the collision when Niasse hit the post, limped off to be replaced by Columbian David Ospina with just over twenty minutes to play. A mistake by DCL in keeping the ball in play saw Mhkitaryan take advantage and another fine cutback found the impressive Aaron Ramsey to complete his hat-trick in the 74th minute ahead of being replaced by Jack Wilshere. Cenk Tosun joined the action on 78 minutes at the expense of Oumar Niasse who, once again, had worked his socks off in a lost cause. Very late appeals for a penalty when DCL went down under a challenge from Mustafi went unheeded, and Arsenal strolled through the final minutes to complete a 10-2 aggregate season score over the Blues. Chopping and changing the side hasn’t proven to be successful at any time during this disaster of a season and today’s starting line-up that saw five changes and a back three was further proof that an unsettled side or the lack of a settled core group is almost guaranteed to be fatal. It wasn’t until Tom Davies came on that Everton looked anything other than cannon fodder for an Arsenal side who, in all honesty, could have won by a much, much bigger margin.